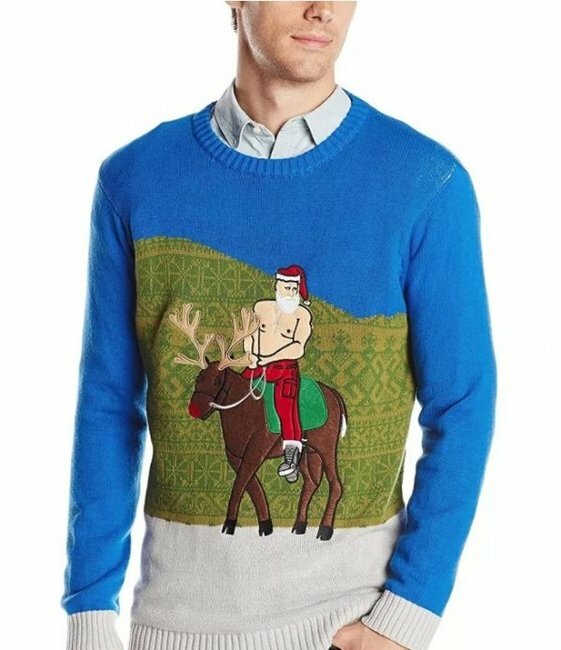 Christmas jumper for men and women: The very best. 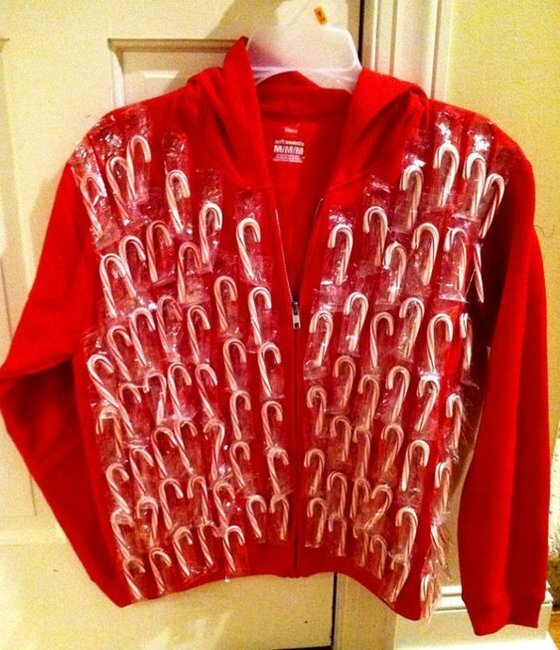 BEHOLD: The ugliest Christmas jumpers on the planet. As a longtime fan of Christmas, I find this time of year a bit hard to handle. It’s at least two months before we start hearing tinny renditions of Here Comes Santa Claus while frantically running around the shops preparing for (as Bridget Jones calls it) the annual Taste-Of-Others exam. Thankfully, this is where Christmas in July comes in. A fun way to celebrate Christmas in the middle of the year without the usual chaos, it’s particularly special for us Southern Hemispherians who want to enjoy a more ‘authentic’ cold-weather Christmas. This means roast turkey, hot cocoa and… the best bit…. Ugly Christmas Jumpers (or sweaters, for those joining us from North America). 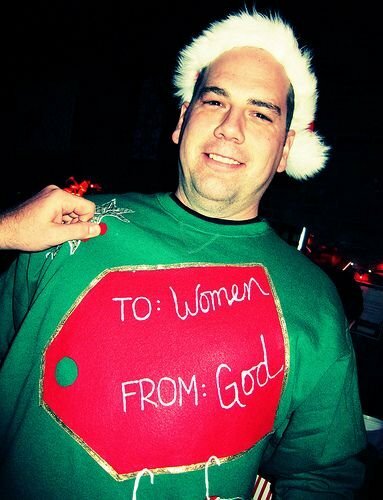 Here is a pictorial journey through our favourite Ugly Christmas Jumpers. Any vest that allows you to carry at least five drinks at one time is a winner in my books. 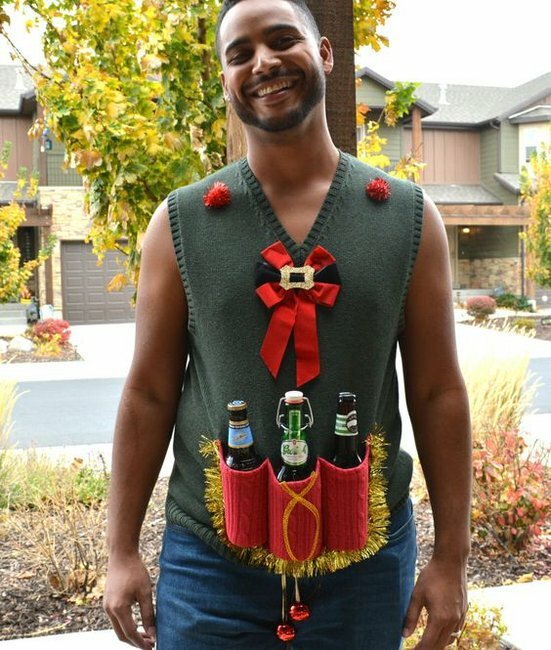 The perfect Christmas vest. Image via Morning Chores. Who wouldn’t want to see a buff Vladmir Putin riding a red-nosed reindeer? This one is simple to execute. 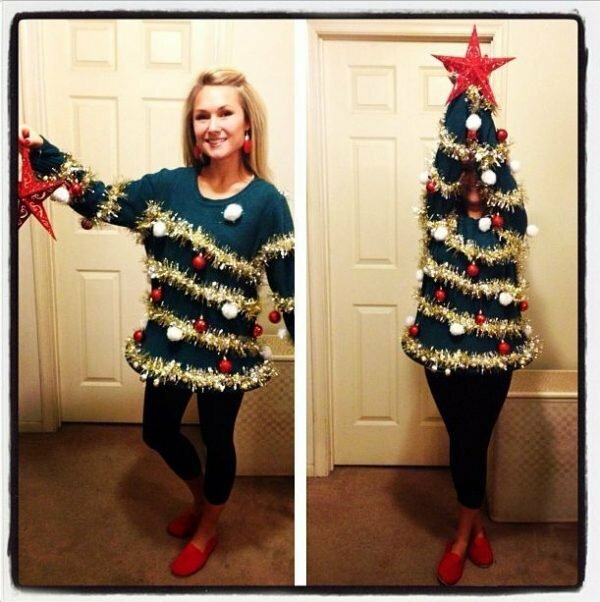 Step 1: Get a dark green jumper and decorate it with baubles and tinsel. Step 2: Find a star and hold it in one hand. Step 3: Put your hands up in the air. Voila, you’re a Christmas tree! …unless you can’t be bothered, in which case, use this LED-lit Christmas jumper instead. 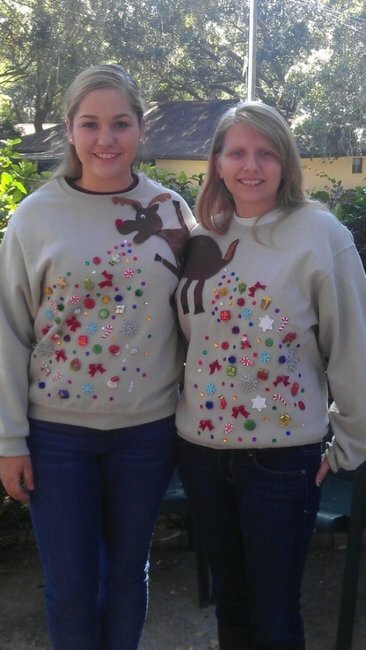 This cutesy pair of jumpers elegantly illustrates the aftermath of Rudolph’s Christmas overindulgence. Finally. 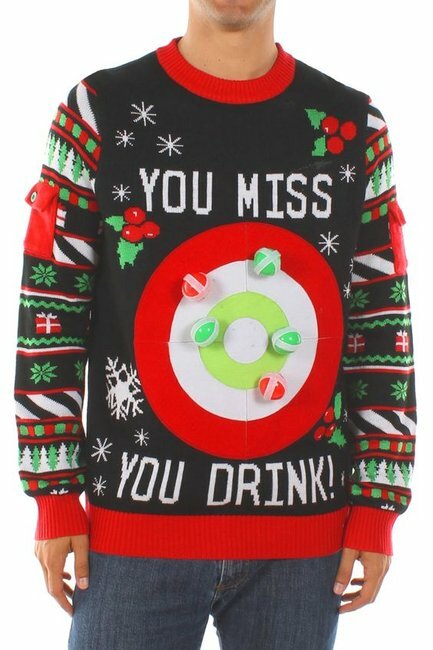 A jumper that combines the joy of Christmas with drinking-game chic. Given the clear directive of “Dress Code – UGLY Christmas jumper”, there’s always that one person who ‘misunderstands’ the brief and turns up in the following. (PS. You know who you are). 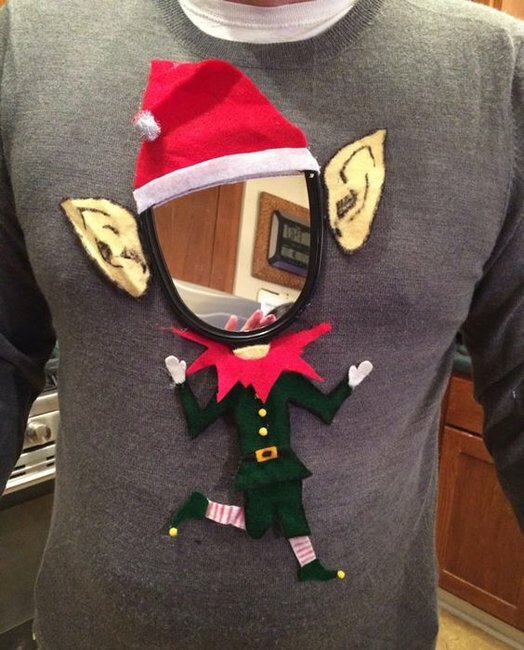 This clever idea replaces the elf’s face with a mirror so that other people can ‘complete’ your sweater. 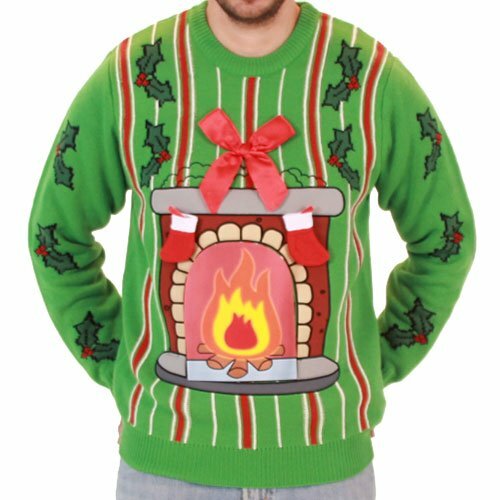 Wear this to your office Xmas-in-July party* and be prepared to have your workmates staring intently at your chest. *Sadly, I could never make this sweater truly ugly because all my colleagues are extremely good-looking. I also hope they’re all reading this. Why settle for having people simply look at your chest, when they can paw at it too? 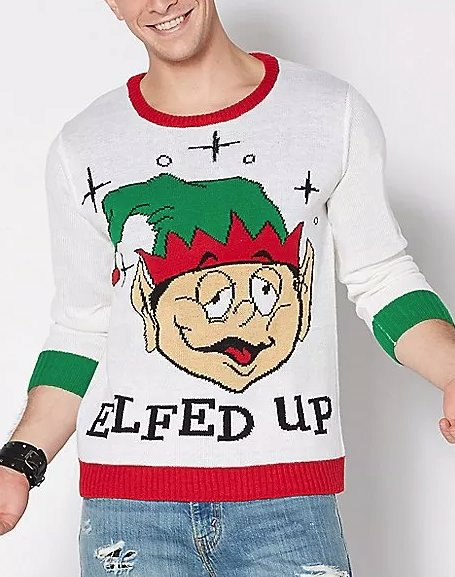 This sweater allows you to spread sweetness and joy to your colleagues, while also providing some much-needed amusement for the HR department. 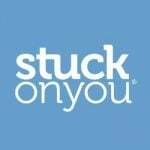 This post originally appeared on Stuck On You and was republished here with full permission.